The kaleidoscope of colors in Cozumel is amazing. Sergeant major fish striped in bright yellow and black. Parrot fish shine as if under a dayglow lamp. French grunts with blue-green shimmering stripes dart among white angelfish as the two schools mingle to avoid the human swimmers ogling them. 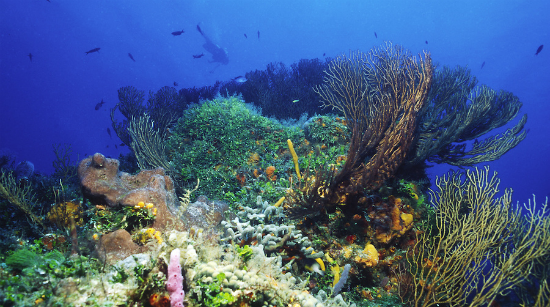 The garlands of reef around Cozumel were discovered many years ago by divers and snorkelers who flocked here for the indescribable beauty of life undersea and a visibility reaching 250 feet. Later, cruise ships began an annual migration like huge pregnant white ducks to the docks of Cozumel. Now both the reefs and the seafront down town become crowded with divers and cruise passengers making the most of their time here. So where is Cozumel? It’s positioned somewhere between the resort atmosphere of Cancun and the laissez-faire attitude of Isla Mujeres. Cozumel casts a magical spell over anyone who sets foot on shore. The island somehow manages to absorb a daily dose of tourists and still maintain a charm all its own. Only about 5% developed, beyond the tourist mecca are spectacular natural wonders and a relaxed lifestyle. The ancient Mayn called the island Ah-Cuzamil-Peten, ‘Place of Swallows,’ and it was an important pilgrimage for Maya women to the temple honoring Ixchel, goddess of fertility and the moon. It was here that Spanish warrior, Hernan Cort‚z, landed in 1518 in an expedition that would develop into the conquest of the continent. He found friendly natives – and so do tourists who disembark nearly 500 years later. 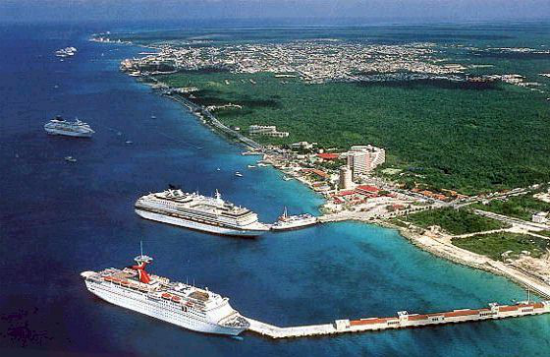 Cozumel became a port of call for Caribbean cruise ships after Jacques Cousteau dove its amazing reefs in the 1950s. Now, an average of 600 cruise ships visit the island annually. It’s also a favorite hop-over for tourists from Cancun. After diseases brought by Europeans decimated the Maya population, Cozumel was virtually abandoned except by pirates, such as Jean Lafitte, who used its shelter of as a base to attack cargo ships. Refugees from the Caste War repopulated the island in the 1800s. You can ‘do’ Cozumel in a day or spend a month and still not ‘do’ everything. The reasons for the island’s popularity are obvious: sparkling emerald waters that hold a coral coat of many colors and a population of warm and friendly Cozumelenos make the island a natural place to be.